Time travel just got a lot more affordable. Pioneer Square’s Smith Tower, aka “Seattle’s original skyscraper,” offers a new take on a classic tour, taking visitors back to when our beloved city was a writhing mass of rum-running cops, basement speakeasies and ne're-do-well industrialists (think Boardwalk Empire set on Elliott Bay). The new tour — called “The Legends of Smith Tower” and opening to the public today (August 25) — is self-guided. That’s perfect if you’ve got kids in tow. 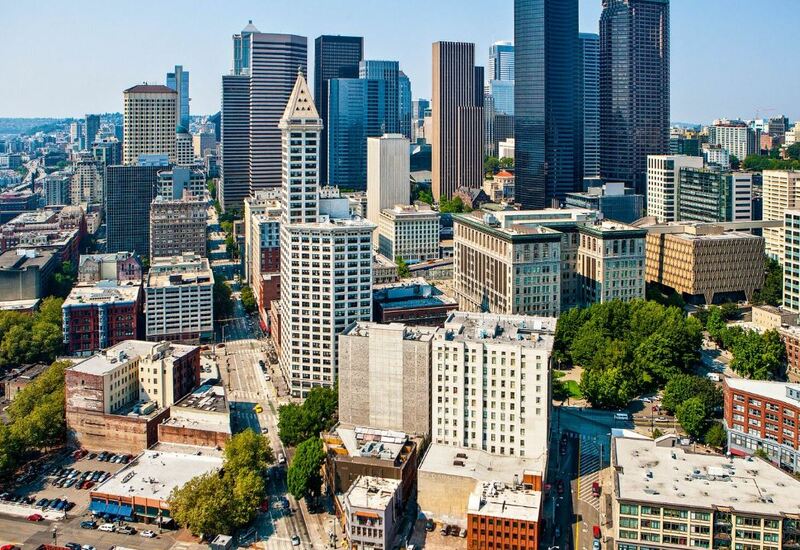 No need to listen to a guide drone on about historic Seattle; instead, you can explore the tower at your leisure. In a surprising reversal of the amusement-park-ride-ends-in-a-gift-store trope, you start this tour in a gift store. Located on the ground floor, Smith Tower Provisions has all the customary tourist trappings (postcards, magnets, totes) as well more local-friendly fare (growlers, Fran’s Chocolates, Full Tilt Ice Cream soda fountain). As easy as it is to get lost in Provisions, push through. Behind the curtain, located at the store’s rear, is where the fun really starts. A series of rooms decked out with classic 1920s props set the mood. Archival footage plays and vintage newspaper clippings line the walls. It’ll feel interactive; it’s really not (though it is fairly kid-proof; most of the props are fastened to their respective spots). Mainly, you’ll read, but the informative text is on the shorter, punchier side, making it fun and easy to read aloud. Also, keep an ear out; the walls supposedly “whisper” with stories from the past though I couldn’t hear much with my noisy crew. Moving on, you’ll take a flight of stairs to a bank of elevators. But before catching a lift to the top — more on that soon — duck into the Switchboard Room. Featuring one of the most hands-on part of the tour, this room offers switchboards where you listen in on the pre-recorded conversations between Tenants of the Tower Past. Each flip of a button calls up another staged telephone exchange; you can move the wires around the switchboard — a nice distraction for tiny fingers. Located at the back of the Switchboard Room, you’ll see what looks like a broom closet. Take a peek at the little porthole located about halfway down the wall to spy on an impressively detailed diorama of the Submarine Room. This, you’ll read, was a famous 1960s LGBTQ club in an era where LGBTQ clubs didn’t officially exist. It’s a good talking point for kids who might not understand the dire need for such secrecy. Now, back to those elevators. These aren’t your run-of-the-mill models; these babies date back to the building’s 1914 opening. Each Otis fits a mere seven people and has nearly all original features (except for the wiring, which, our lift operator kindly informed us, was updated “just a few years ago”). This is the type of cage-closed, brass-lined, lever-operated elevator you’ll see in the Eiffel Tower, Empire State Building or that one scene in Titantic when Jack and Rose go to first-class dinner. Once aboard, you’ll whiz up 35 floors (the tower has 38 total but those top three are a private apartment). Each story flies by through the elevator’s semi-see-through door. (Fun fact: The entire elevator used to be encased in glass but, as the same handy operator informed us, “that wasn’t exactly up to code.”) With a slightly shocking lurch, the elevator stops and opens to what was once called the Chinese Room (now known as the Smith Tower Observatory). Urban legend holds that we’ve got Chinese Empress Cixi to thank for the splendor in this room. Not so, according to the signage. The intricately carved furniture and paneling came from a variety of markedly less exotic sources including Philadelphia and Syracuse, New York. Regardless, there’s no doubting the beauty of the famous Wishing Chair (origins unknown). In an archaic if ever-so-slightly endearing nod, it’s said that any single woman who sits in the chair will be married within a year. Rumor has it the chair did the trick for a Smith daughter, who wed in the Chinese Room after taking a seat a year prior. All of this luxury, however, pales in comparison to the view. You’re more than 300 feet up with a 360-degree view of the city. The entire walkway is caged floor to ceiling but the spaces between the bars are wide enough for tiny limbs (and the cell phones those limbs may be holding). It feels safe but, as with any up-high spot, you’ll want to keep an eye on the more adventurous visitors in your group. On a clear day, you can see the Olympics on one side, Mount Rainier on the other. The 943-foot Columbia Tower looms nearby but the coolest view is the nearly direct-shot view into CenturyLink. Can you go higher in Seattle? Sure (the Space Needle is nearly 200 feet taller not to mention Columbia Tower) but what 462-foot Smith may lack in height, it makes up for in grandeur. This new tour tips its hat to history and takes a wink. Is it worth the steep, if theme-appropriate admission of $19.14? Up to you, but it sure is a helluva view. ParentMap writers sometimes receive tickets, entrances and stays at press rate. All our content is independent and reviews are our own opinions. Admission: The Smith Tour currently offers two options. A third, “The Bootleg King,” is set to debut this winter and features “mystery, clues and discovery” tied to the story of the Bootleg King himself, Roy Olmstead. For “The Legends of Smith Tower”: Adult (13-64), $19.14; children (5-12), $14; seniors over 65 and military with ID, $17. For “Straight Up” (aka no tour, just access to the observatory deck and the Temperance café and bar on the 35th floor): All ages, $10. Hours: “The Legends of Smith Tower” tour runs every 10 minutes beginning at 10 a.m. daily. Ticket sales end at 5:30 p.m.; tours end by 6 p.m. “Straight Up” tickets are available in limited quantities from 9 to 10 a.m. and 4 to 5:30 p.m. daily. Length of tour: Smith Tower says the tour takes 40 minutes; I’d say more like 30, even 20 if you skip some of the reading material. Adults only: Consider making Smith Tower a date-night destination. The all-ages Temperance café and bar on the 35th floor features “speakeasy-inspired” food, which we take means a lot of liquor. Note: This tour features several sets of stairs but an elevator is available so you can skip the stairwell connecting the ground floor to the Switchboard Room and elevator bank. Call add for additional accessibility details.